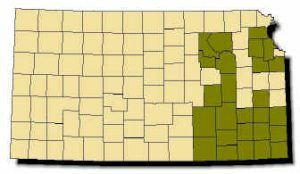 Range: Found throughout the eastern third of Kansas from the western edge of the Flint Hills east to the Missouri border; absent from counties along the Nebraska border. An isolated record from Atchison. Description: Harmless. Scales smooth. Head slightly darker than body. Body overall light gray to brown to reddish-brown with salmon-pink belly. Six scales on each upper lip. Young same as adults. Habits: Found in varying habitats, from wooded hillside to rock outcrop on prairies, from rural areas to city parks, but always under rocks or flat debris such as boards and sheet metal. Very secretive; rarely seen in open. Never bites. 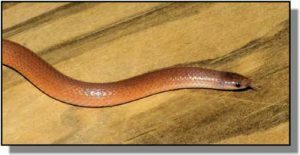 Eats small invertebrates such as centipedes and spiders and probably insects and their larvae.